Dream. Build. Play. It comes and goes every year. Since I started XNA a few years ago I've registered for every one. All of them have past, none of them have I submitted anything for. This will all hopefully change this year. This year I have made a promise to myself that I will submit something, and to make things even harder I've given myself the task to create it from the date of registration to the date of submission to complete it. This means that when the submission deadline comes around I will be submitting whatever I have done. No matter what! Will I end up with a good project? I sure hope so. I have picked a concept that I have been spec'ing for a little while now (both in my head and on paper). The concept is simpler to my other project, which will mean I have more of a chance of finishing it. But it will be every bit as fun and interesting. I'm also making things harder by only giving myself the weekends to work on it (freeing up the weekdays for relaxing or working on my platformer still). Of course, when time inevitably starts to run out this will probably change. So that's the plan and registration has been open for a couple of weeks. So how far am I in the project? To every bit ensure that I finish this project I have started off by making the part that usually makes me stop working on a project. The menu system. This first screenshot is my version of the traditional "press start" screen. 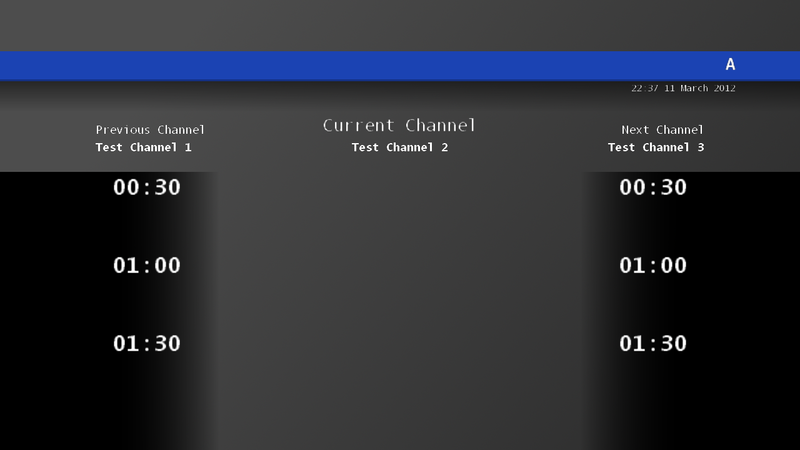 At the moment it's not much, but my vision is to have a info-mercial styled intro, based on the channels you get on set-top boxes that explain to their users how to use a remote. I'm hoping this will be enough of a hint to my users in what is expected of them. 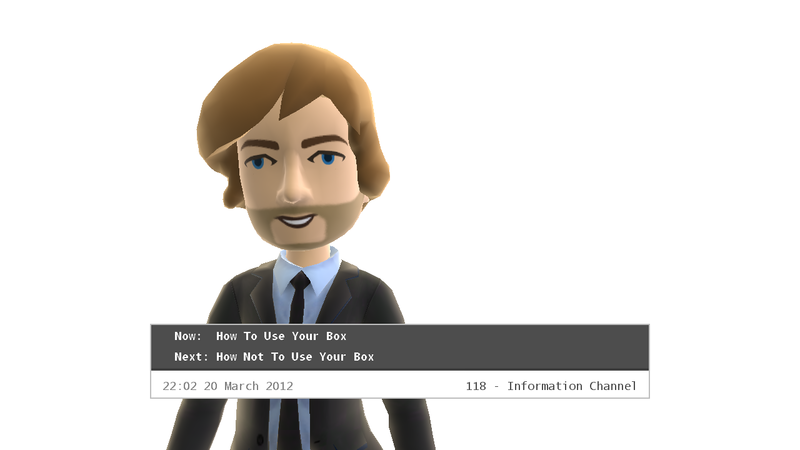 This is the main menu. 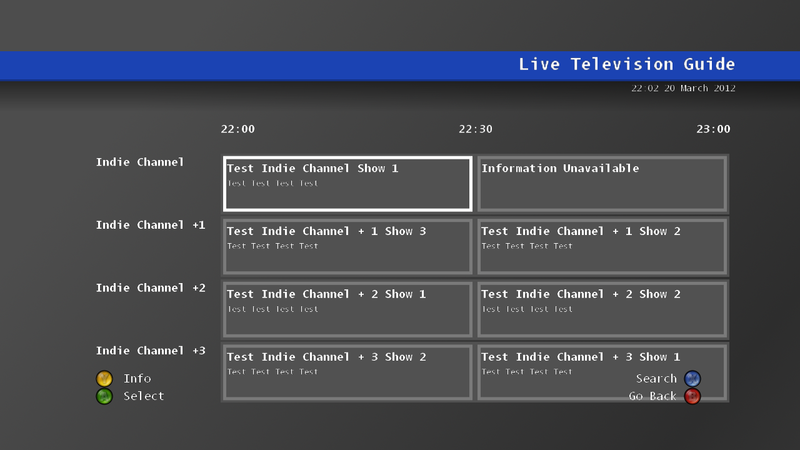 I've based it on a set top box menu system to give the impression you are picking a show. This screenshot is a bit outdated as there really is only a planner and settings screen. But the idea is there. This is how my planner started out. 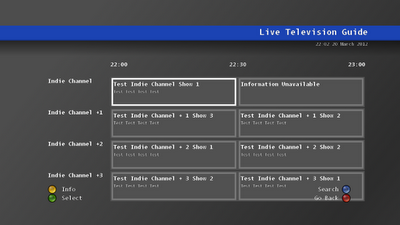 A simple screen that showed a handful of "shows". Each show would represent a different mode of play. But I felt that this didn't show enough information to the player. It also had a bit more of a metro twist feel that I felt might not go down so well with the big M.
And this is how, near enough, the main planner will look. As you can see it is more feature rich. 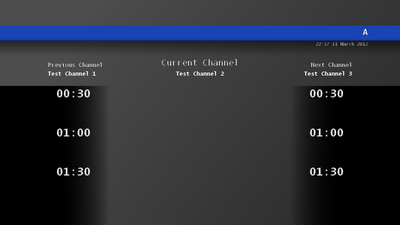 I'm planning on adding an info screen, which will display more information about the selected show. The first four shows on the first four channels will now represent the different game modes that can be played and the rest of the shows will contain a mixture of fake mockery shows and possibly other Indie games. So there's a glimpse into what I've developed so far, but there's still a lot more to do. 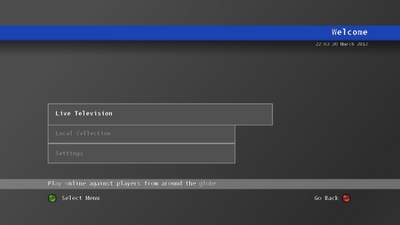 It's not got quite the polish I'm wanting at the end, but the main functionality is there which is the main thing. 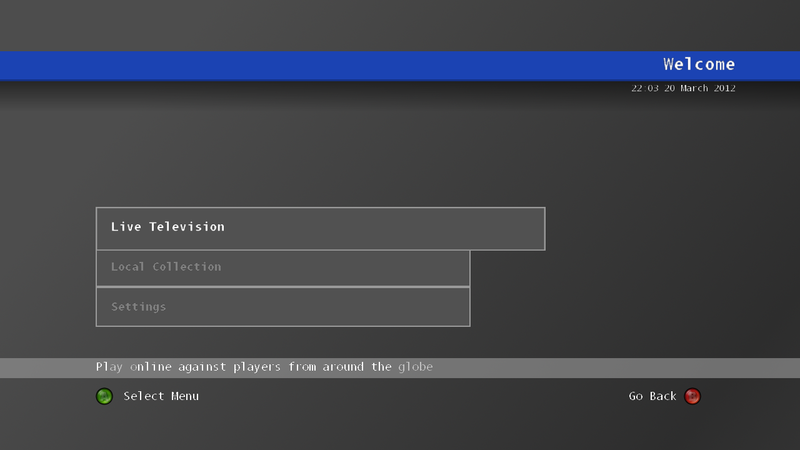 This weekend I hope to design my loading screen and the player select screen. So you could say the menu isn't finished. But to me it's definitely a step in the right direction.